Hey your photos look great Emily. I’ve been saying I’m going to set up an Etsy account for months, one of these days. I can completely empathize with you! 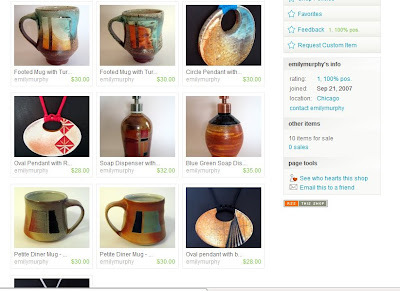 My Etsy shop has been set up and empty since August. One of my 2009 goals is to finally take the Etsy plunge – perfect photos or otherwise. Congratulations on jumping in! It looks great! You make beautiful things Emily. I look forward to the day when I can access a wood-fired kiln. I’m wishing you happy holidays and an empty Etsy shop because you have sold it all.